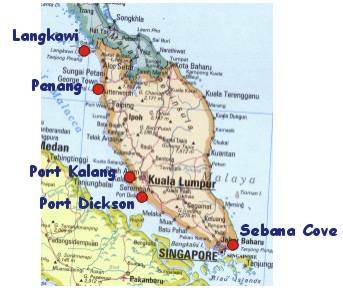 Malaysia is a cruising destination for Australian and New Zealand yachties - sort of like the Caribbean is for the USA. Very nice people, interesting culture, and low costs make it ideal for the cruiser on a budget. For circumnavigators, it is a civilized spot for low-cost provisioning and sightseeing. Port Kalang - a working port with anchorages and a cozy yacht club with moorings - and strong current! Lumut - no information at the moment. Langkawi - duty-free haven for liquor buyers, it has a couple of marinas and the best anchorges on the Malacca Straits. First port - Check in with Port Authority, Immigration and Customs. Intermediate ports - Check in and out with Port Authority for that port. Last port - Check out with Port Authority or Harbour Master, Customs and Immigration. The locations of the authorities vary from city to city, but they are generally close to the port operations and can usually be reached by walking.